Netra Sudarshan Ark (also called Palashanjan) is a distillate of roots of Butea Monosperma (Palash – Sacred Tree). It is used as an eye drop as well as for internally. As an eye drop, it is unique and proven ayurvedic medicine that protects the eyes from all types of diseases including conjunctivitis, cataract, night blindness, eye fatigue, weak eyesight, and diabetic retinopathy. Its regular use for at least 6 months is highly efficacious to treat cataract without surgery. Especially, it is highly useful to treat immature cataract. It has helped many people to get rid of glasses (spectacles) forever. Furthermore, Netra Sudarshan Ark also acts as a digestive stimulant, hepatoprotective and liver stimulant. Thus, it improves overall digestion and metabolism. For this reason, it is also used internally (orally). Netra Sudarshan Ark is prepared from the roots of Butea Monosperma (Palash – Sacred Tree). Roots are cut into small pieces and crushed, added in distillation equipment with sufficient water and distillate prepared. The distillate is preserved in a sterilized glass bottles. Netra Sudarshan Ark generally acts as an anti-inflammatory, so it reduces inflammation occurring in various eye diseases. It also reduces the opacity of the lens, which is likely to occur due to its protective effects on the lens that probably prevents degradation and denaturation of the lens proteins and might restore the lens health. Oral use of Netra Sudarshan Ark acts as a digestive stimulant, hepatoprotective and hepato-stimulant. Oral use is indicated in poor digestive function, liver diseases, and other abdominal diseases. It is also helpful in spermatorrhea, a men’s health problem when 3 to 5 drops of Netra Sudarshan Ark are taken with betel leaf. 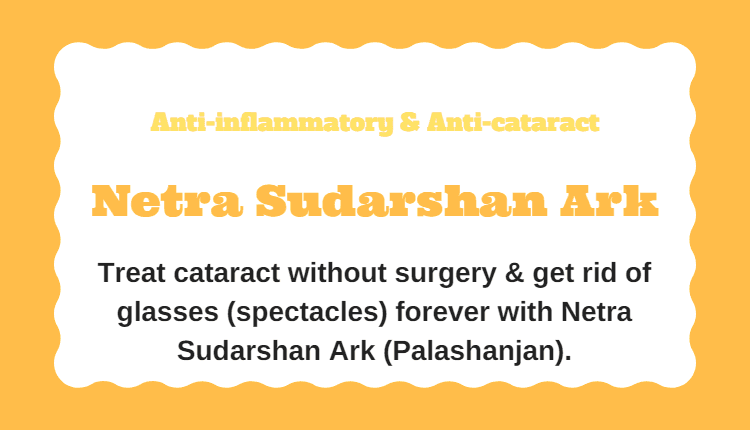 Instill 2 to 3 drops of Netra Sudarshan Ark into each eye 3 times a day. Wash your hands with soap and water. Dry hands with a clean towel. You can also use hand sanitizer. Gather a bottle of Netra Sudarshan Ark and a clean cloth to wipe away excess drops. Shake the bottle of Netra Sudarshan Ark. Remove the cap from the bottle and keep it on a clean surface. Now, instill 2 to 3 drops of Netra Sudarshan Ark into the eyes. Close the eyes gently for 10 minutes. Avoid touching eyes, blinking, moving eyeball and squeezing eyelids tightly shut. Use a clean cloth to wipe away any excess liquid from around the eyes. Note: First, Palashanjan Ark might also cause a slight Irritation in eyes, which itself cools down within a few minutes. Netra Sudarshan Ark or Palashanjan is considerably safe to use. There are no side effects reported with Netra Sudarshan Ark. There are no absolute contraindications for Netra Sudarshan Ark. As an eye drop, pregnant women and lactating mothers can use it for their eye problems. Consult an ayurvedic physician before taking it internally by mouth. Age 65, I have dry eyes and doctor has prescribed Tears Naturale Forte. No other problem in eye or health. Good health. Will Netra Sudarshan Arq help, if I discontinue the Tears Naturale and use this instead? Netra Sudarshan Arq does not work like lubricant eye drops. However, it helps by alleviating inflammation of the ocular surface and tear glands, if these are the underlying causes of dry eyes. Generally, inflammation of the ocular surface is the cause of dry eye disease, which is also mostly undiagnosed. Thanks. I’m reading in some reports that samples of this medicine were found contaminated in 4 brands. Would you know of any brand which is more reliable than others, in this category? Netra Sudarshan Ark is not a brand name. It is classical name as per text book. The reports have not given any name of manufactured. You can buy Netra Sudarshan Ark manufacturer by Krishna Gopal Ayurved Bhawan, Kalera. It is also a bad news for ayurveda lovers. We have very effective medicines, but many of ayurveda manufacturers are not doing good job. That’s the reason why we have to prepare medicines ourselves for our patients and because we are not getting good results with medicines available in the market. Does sudarsan ark work for diabetic retinopathy? Yes, it prevents diabetic retinopathy and also helps to treat it. I’m 47 yrs, male having T2 DM for 16 yrs. My Fasting sugar is 101 and PP 105. I’m having one medicine in morning and three in night for my diabetic problems as per my allopathic doctor. I’m having eye sight problems. It is 1.75 near and 1.5 far. Please tell which ayurvedic medicine I should take for my eye problems. Netra Sudarshan Ark is also good medicine. Alternatively, one can also use Isotine Eye Drops. My long sightedness is poor. My right eye lens no. is 2.15 & left is 1.25 so , can I use it to cure my poor eyesight & get rid of my spectacles. Hope so, Palashanjan should help.